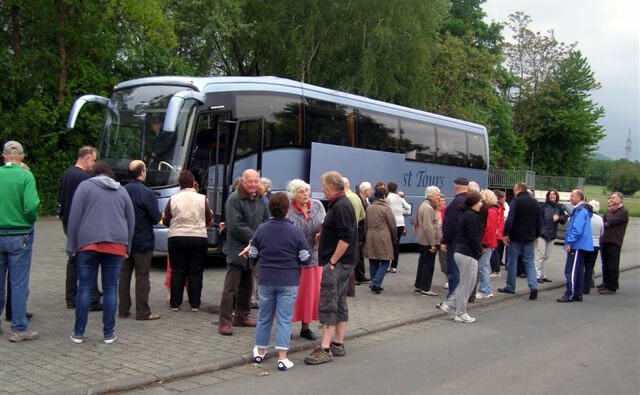 In May this year we embarked on our usual bi-annual visit to Lahnau, our twin town in Germany. This is a long trip but we always have a very enjoyable time once we arrive in Lahnau. This year I was not able to go due to other personal commitments but I am assured by our chairman that a good time was had by all. Pictures below are of a trip to Oldenwald on the Monday which was a very interesting place. 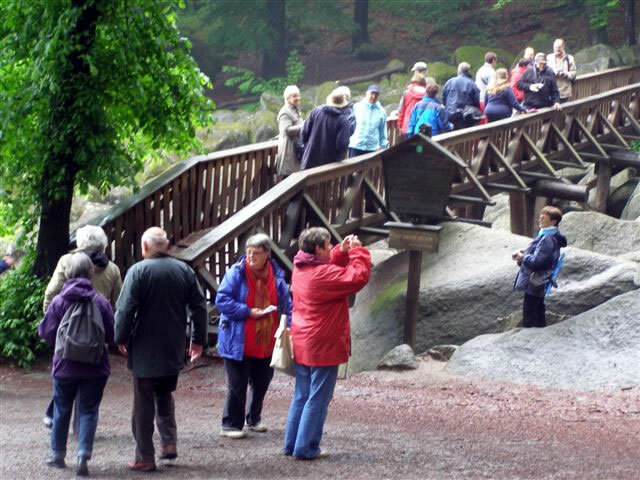 They are crossing a bridge to go on quite a strenuous walk. 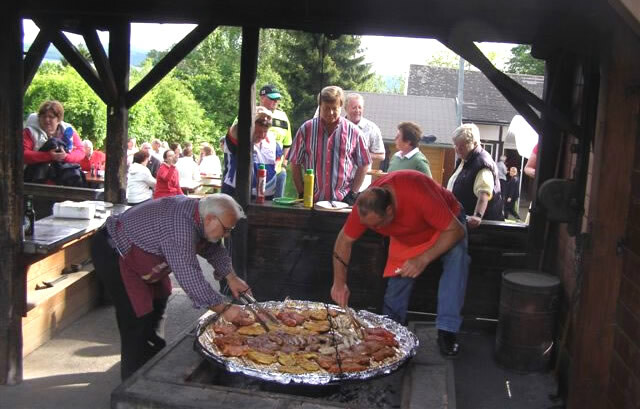 The other picture was taken at the BBQ (as we call it but they know it as the Grill Party) and is in an area in Waldgirmes where they have a special place to do all the cooking. Just look at the size of the pan they are cooking the meats on. It gets really hot in there but it is all such good fun. Whilst waiting we all sat outside at the tables drinking beer, wine, water or whatever and chatting and catching up on the week. This event took place on the Thursday. The man on the left of the picture is the Chariman of the Lahnau twinning in Germany; he is Rudi Tonigold. During the week away there were many free days spent with families and this is a very good time for getting to know your hosts and how they live and the area they live in. When we go we always go somewhere different; we think we have exhausted all the places and our hosts manage to pull another one out of the bag for us. This time our hosts also arranged a trip to Bad Ems, a spa town, which was rather a wet day. They should also have gone on a boat trip on the River Lahn to Koblenze but due to such a lot of rain the river levels were too high and heads would have been lost under the bridges. But they all still had a great day. Leaving Lahnau at 6.00am in the morning for the return trip home, this is always the sad part but we all know that the following year we will be welcoming most of them into our homes in Wincanton. They will be arriving in July 2014. The journey home was somewhat stressful for the wonderful bus drivers as in Belgium they have decided to renew all the road surfaces and because of the hold-ups they missed their booked ferry home. Luckily they just managed to catch the last one to leave Calais that evening so all ended well, but they were very late home and all very tired after a long day. To Keep the funds rolling over and a healthy bank balance we hold events throughout the year and this year we held our Annual Lunch in February in the David Sharp Centre, which was once again well attended and enjoyed by all there. We usually serve a hot lunch followed by a choice of desserts. At each event we always run a raffle; this just helps towards expenses and adds to our funds. 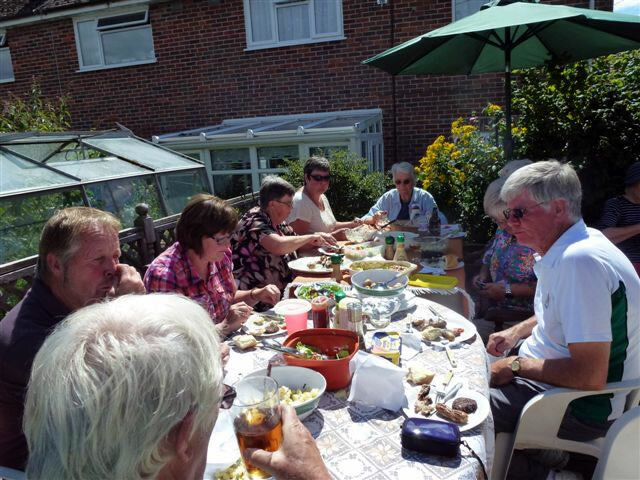 In August we had our annual BBQ at the home of Phil and Yvonne Rodgers. We were very lucky this year and had a lovely sunny day. Again, some of the food is provided by the committee and members and we then just charge for the meats and rolls. This year there were about a dozen members. As you can see from the picture, we all enjoyed the day. If anyone would like to join this lively active association you are most welcome. Please contact either Phil Rodgers, the Chairman, on 01963 32508 or Gill D'Arcy, the Secretary, on 01963 33160 and they will be able to give you more details. Out Bi-Annual AGM is coming up in November and we are always looking for new people to join us. This will be held in the Town Hall on Friday 8th November at 7.30pm. It will be followed by a Bring and Share German Food Evening and a slide show of this year's visit to Lahnau. We look forward to welcoming you to this evening.